I'm glad your fear wasn't realised once you and the guitar settled in. I think it's lovely. I seriously considered asking Jim to take a picture of mine just so I could see what it looked like,lol. Ben, all things are cleared. Nothing was mentioned to Jim about setup problems done by him. We basically just discussed my setup & then the other points for about 20 secs.. No names, nothing of the sort. No problemo. People, now that things have "died down" with the balance due (with my wife), I can actually sit back & enjoy waiting for it's it's arrival. My LS-03 IS/HOG HB will be coming home to pappy! Norman, it took me about 2 secs. to get used to the 1& 7/8 neck on the SD. All of my guitars have different widths, so I adapt to each easily. Love the wider neck, like on your LSV-11. Since you fingerpick, it must be nice! I still owe you a call: I didn't forget. Just been busy trying to sell things & keep all happy! Talk soon. Matt are you fingerpicking with nail or flesh? Or a little of both? If you've been following the bouncing ball you know I've just been realy digging into fingerpicking the last 2 or 3 months. I spent about a year learning BASIC banjo. Half the reason was to take it back to guitar. on that depending on what I'm playing. And Holly, know that fret killer rest his wrist on bridge sometimes. Mostly going with the fingerpicks right now but bare fingers I like as well. I like the tone and have better control with bare fingers but want to be heard when I play with others. I know I need to chill and not pick as hard. I was playing with that while son was at soccer practice, making myself play with not as much force, and it yielded better control. I'm wide open at anytime for tips on fingerpicking while I'm formulating my bad habits! Just thought I would add my two cents in here on fingerpicking, for what its worth. I have tried fingerpicks but just couldn't get into it, I always thought the picks gave the guitar a thin sound. Too much fingernail also does the same thing. So I have just a little bit of nail and a lot of flesh on the string. Gives a warmer if slightly dampened sound so I grab the string a bit harder. It helps if your guitar has good bass response, like the Forum III. What I've learned over the years is not be timid about plucking the strings. I know it sounds wimpy but I've always used the Classical method. It's very gentle and subtle but it sounds precise and more importantly, consistant. If volume is a major issue, I'd be looking at a pick up instead of trying to force something that isn't meant to be forced. Try simply drawing the tip of your finger across the string and allowing the nail to follow through. DO NOT HOOK YOUR FINGER. The bend should happen naturally. If I'm recalling correctly, it's all from the first finger joint. After the first knuckle needs to be relaxed. Shake your fingers out and REALX your hand. Less really is more. I can't play much of anything. But, what I can play sounds lovely and precise and you can draw a lot more feeling and emphasis when it flows from your center rather than picking it out with a digit. If you have to be aware of how hard you are plucking a string, it's not flowing, it's not a natural movement and it will sound forced. I think peple don't realise any musical intrument is played with really, most of the body working in unison. I don't know if that makes any sense and probabaly sounds a little 'wax on, wax off' but I stick by it. Matt, you know like a bagiliiion more than I do about music, thoery and playing. But hey, you asked,lol. I continue to be amazed at how much can be gotten out of a guitar with precise, deliberate movements. Ok, I don't strum at all, so take that for what it's worth. But I will say playing relaxed and not feeling as if I have to keep up or be as loud, is key. Or, you know, would be if I was playing with people. Ack! Those beauties...If only I had discovered Larrivees earlier! 1982...............Then you could say you were spoiled long ago. Some songs sound great with that separation but I'm finding I have a tendency to almost use it as punctuation and if I'm not paying attention it develops more of a leaden sound. Then if i use it evenly throughout it looses definition. Some passages you want to draw attention to, it's just figuring out where those are and not being ham fisted about the whole thing. Playing Cohen is where it gets tricky for me, there's a rolling quality to his music but there is also room for intensity and I'm trying to feel that intensity without it traveling down to my thumb. I don't think music needs to be spelled out in order to get across, you know? I don't think music needs to be spelled out in order to get across, you know? I do like a strong thumb though. I've got more of a Travis mentality. I was lucky enough 20+ years ago to have a very good friend who also lived with me for a couple of the years, that was a great finger picker. His thumb was strong, accurate and like a clock. That's whats ingrained in the brain. But if your gonna play the thumb hard it can't be just meandering like a lost puppy. That's what I'm concentrated on now. Perhaps I'll send you an MP3 of a song or 2 of Tom's. I recorded that Jewel of a picker shortly before he died. Quite the charactor too, to say the least. Wow! A great picture! And then... a very cool guitar. Flatlander, nice pic & nice guitar! That's about 11 years before I got my L-10. Knew of them somewhat, but didn't think I could afford one. Boy, how $ makes a difference. Came into a settlement & ordered my L-10 Custom in '93. 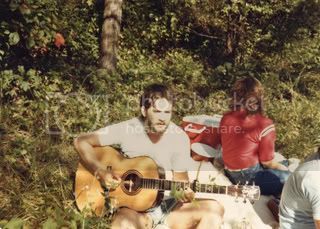 Unfortunately, my earliest pic, other than an electric, is of me playing a Flammang HOG OM (spruce top). Looks like you're flatpicking there, might be wrong. When did you start fingerpicking? It sounds like you have it down pretty well. I don't fingerpick because of my upside- down playing, about the only real thing I regret about learning that way. Once started, couldn't switch. Have overcome "adversity" & have it down well now. Wish I could learn to fingerpick. Anyone know of any "Albert King" style players, like me, that can fingerpick? I'd love to contact someone. Again, nice guitar & now you've "aged" yourself. Probably like a fine wine, I'm sure! Wish I could learn to fingerpick. Anyone know of any "Albert King" style players, like me, that can fingerpick? I'd love to contact someone. Elizibeth Cotton fingerpicked with a guitar strung upside down. There a some You Tube videos of her. Maybe I'm missing something, but why can't you just learn it another way? If you got to this level learning it one way and are willing to start over learning another, then why not? It's not like all your fingers fell off or can only go in one direction. Why can't you switch? I just think you are creating an obstacle that doesn't exist and selling yourself terribly short in the process. You had to learn one way, seems you can learn another. Imean, you had to learn a HARD way, fcol. This might even be easier. I do beleive that your skill now will carry over and greatly aid in the process. Give yourself more credit. Are there any Canadians out there that had their Forum III guitars sent to Trinity Guitar and then shipped back to Canada. My guitar was accidentally sent there and I'm worried about brokerage fees now. I would hope that the party who committed the error would cover that. That would be my expectation. these guitars are very well built :) I am very happy with it! #1- holly, I've been playing like this for over 30 yrs., so it's not that easy to do. I'm destined to play this way & can't learn lefty (I'm lefthanded). Totaly freak me out! It's not as easy, as I said, to start over @ 51 & learn again. Besides, I play well, am content with my playing, & missed out on 1 person in my area years ago that fingerpicked playing like I do. I know of one other person in CT that plays this way, so it is fate & grows on me like holly! #2-bhika- I don't change the strings around, just turn turn whole guitar around & play. Lots have played the way you said (hendrix the first to come to mind), but only a handful play like I do. They play right-handed guitars restrung righty. I don't. If you saw me playing, you wouldn't be able to figure out WHAT I was playing. It would all be backwards to you! And absolutly confusing. My brother, who's a pro guitarist, just listens to what I'm playing or I call the chords out to him. Sound like fun? Try taking a lefty, turning it righty, then you'll be where I'm @. Makes sense? No, I believe all Canadian Forum IIIs either left Vancouver with us personally or were shipped directly. Yes, brokerage fees will definitely be incurred. I think you should contact Jim.